io9 has a look at the Industrial Light & Magic Presents: Making Solo: A Star Wars Story book. In sad news, Vonda N. McIntyre, the author of the Star Wars Legends novel The Crystal Star, has passed away. Vonda did much more than create one of the most controversial Star Wars villains, Waru, she was also the third woman to win a Hugo Award, she wrote the first original Star Trek novel for the Pocket Books line, and she came up with Sulu and Uhura’s first names. She will be missed, but her books shall live on. I missed this but Jedi Bibliotheck spotted it back in early March, but it looks like they’re doing a Haynes manual for the TIE Fighter. It’s set for an October release. The lotteries have been extended to April 8th so if you haven entered yet there is still time. They’ve revealed more Celebration merchandise on the official site. The collecting sites will have a six piece Celebration patch set you can collect. Here’s a look at all the Star Tots which will be available. Del Rey has revealed their author signing times, and which authors will be at the From A Certain Point of View mega signing. DK will also have signings for its authors. Jason Fry posted his schedule here. Dave Dorman is working on a Rogue One painting he hopes to have done for Celebration. There will not be prints of it available. However, Dave is supplying the artwork for the SWCC VIP package limited edition print, which looks gorgeous. 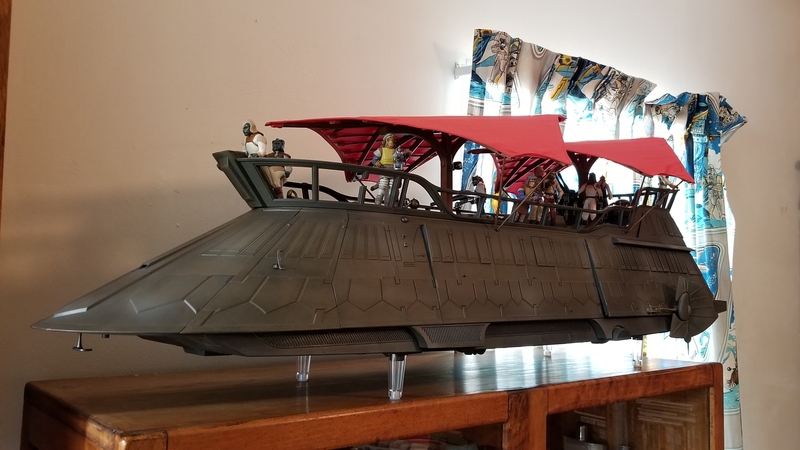 Well the barge has arrived, and this thing is awesome. It’s also huge. Here’s a look at what you might be missing out on. Okay, I thought this was a joke on The Star Wars Show, but this is a real book that’s coming out this year. This looks awesome. How Not to Get Eaten by Ewoks (and Other Galactic Survival Skills) by Christian Blauvelt will be out in hardcover on September 24, 2019. StarWars.com has an interview with the author and some previews of interior graphs/pictograms. You can pre-order it here. For those going to Star Wars Celebration Chicago, they’ve announced that Monday will be The Phantom Menace 20th Anniversary on the Celebration Stage. They’ve also announced more guests: Billy Dee Williams, Freddie Prinze Jr., Alan Tudyk, Taylor Gray, Michael Culver, Julian Glover, John Morton, and Anthony Forest. Pensacon is February 22 to 24 in Pensacola, FL. Star Wars guests include Julian Glover, Claudia Gray, Taylor Gray, Bill Hargreaves, Alan Harris, Guy Henry, Cathy Munroe, Clive Revill, Felix Silla, Jim Swearingen, and Timothy Zahn. Classic Plastics Toy & Comic Expo is March 2 to 3 in Parkersburg, WV. Star Wars guests include Timothy Zahn. MidSouthCon 37 is March 15 to 17 in Memphis, TN. Star Wars guests include Timothy Zahn. StarWars.com has an excerpt from Claudia Gray’s upcoming novel Master and Apprentice. IGN announced a new book The Art of Star Wars Rebels. Interestingly enough, it’s a Dark Horse/Lucasfilm project which will include commentary from Dave Filoni, Simon Kinberg and Carrie Beck and will be written by Dan Wallace, which sounds like a solid plan for success. It’ll be out this October and pre-orders are already available. Fans have been wondering if there’s any chance of them going back to Legends to tell more stories. Well, Marvel is taking the plunge, though they’re going old school and doing a Marvel Star Wars #108 one-shot that continues the old Marvel Star Wars comics line, be it only with one issue. Hopefully this trend will continue and one day we’ll get some new Legends novels with the old characters we fell in love with and got invested in. Plus more Celebration guests have been announced. StarWars.com has more on the upcoming books and comics tied in to Galaxy’s Edge including the young reader books A Crash of Fate by Zoraida Córdova (August 2019), and Star Wars: Myths & Fables by George Mann and Grant Griffin (August 2019). A Star Wars Comic #18 is out now for free. Star Wars comic writer Kieron Gillen will be stepping away from Star Wars after Star Wars #67. Some fan props and sets for Celebration have been revealed. StarWars.com has also revealed some of the voice actors heading to Celebration. Star Trek: The Cruise III is January 4 to 10 in Miami, FL. Star Wars guests include Jason Isaacs, and Brent Spiner. Wizard World New Orleans is January 4 to 6 in New Orleans, LA. Star Wars guests include Mads Mikkelsen. Ace Comic Con is January 11 to 13 in Glendale, AZ. Star Wars guests include David Tenant. Albuquerque Comic Con is January 18 to 20 in Albuquerque, NM. Star Wars guests include Michael Bell, Michael Carter, Howard Chaykin, Mark Dodson, Peter Mayhew, Femi Taylor, and Keone Young. STCE’s Comic Con is January 26 to 27 in Laredo, TX. Star Wars guests include Greg Baldwin, Grant Gould, and Ray Park. Pasadena Comic Convention & Toy Show is January 27 in Pasadena, CA. Star Wars guests include Julie Dolan, and Kevin Thompson. Marvel is offering up to 83% off their online comic collections until January 3rd. The theme for Celebration’s diorama workshop has been revealed – The Battle of Scarif. StarWars.com has an interview with Darth Vader comic writer Charles Soule covering the end of the series. Warwick Davis will be returning to Star Wars Celebration as a stage host. He’ll be joining Amy Ratcliffe, David Collins, Mark Newbold, and Gus Lopez. One other matter of note, parking passes are now on sale. And they are not cheap. LemiCon is December 22 in Houten, Netherlands. Star Wars guests include Clem So. Adventures in Poor Taste has a preview of Solo #3. Holiday Matsuri is December 14 to 16 in Orlando, FL. Star Wars guests include Jennifer Hale.